Florida Speedweeks. New Smyrna Speedway in New Smyrna, FL. These are things that cater to the Florida drivers. This is a track they see week in and week out, several times a year and a place they've all raced several times in their career. 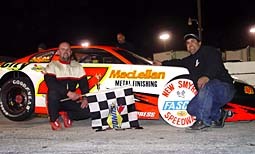 However, on Saturday night, is was a Massachusetts driver who tamed the fast half-mile during the second night of the World Series of Asphalt Stock Car Racing. For Middleton, the second-consecutive second-place finish was a little tough to swallow. Once Mechalides caught him, he made little work of motoring by Middleton. “We’ve had a awesome race car the last two nights,” said a frustrated Middleton. “We should have won both nights by far. The motor is just killing me. Everyone is out-motoring me. Every time we get beside someone and the drag race is on, they just kill me to the corner. Louis Mechalides took the lead from pole sitter Jay Middleton and pulled away, dominating the remainder of the 25-lap Super Late Model feature. It was a big first win for the New Hampshire Pro Stock (Super Late Model) driver, after many years of coming to Speedweeks. “I'm pretty excited about the win,” said Mechalides. “It's probably five years now that we have come down here. I've come close a whole bunch of times... 98 laps of 100-lappers. But I have never gotten a Speedweeks win. “Most of the people that come down here and help me... they need a vacation. They seem to want to help more when they come down here and take a week to hang around the racetrack. It's kinda more of a vacation down here for most of the guys. “The 47 (Mechalides) knocked me sideways, which is alright. But he gassed it up and just blew me away to the corner. It's a joke. I can’t compete with that. The car is perfect. I just can’t stay up with that. Despite being disappointed, Middleton does have something to look forward to. With two second-place finishes, he is now leading the point standings. Jay Middleton was not happy with his second place finish. David Rogers finished third, with Jack Landis fourth and Ted Christopher fifth. Two of the biggest names in the field, and two of Florida's best, had a short night on Saturday when they got tangled up just two laps into the race. For Travis Kittleson, the accident was big because it put a big kink into his hopes for winning the Speedweeks championship after winning on the first night of action on Friday. For Mike Fritts, who was the night's pole winner after breaking the track record, it was big as well. 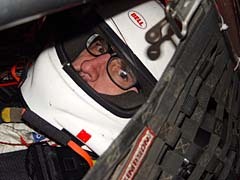 Fritts is piloting Frankie Grill's Grand American Race Cars “house car” during Speedweeks. He is also the defending Speedweeks Super Late Model Series champion. When interviewed by Speed51.com, Fritts seemed to place most of the blame on himself, but did say that Kittleson did get into him. “I just got loose getting into the corner and then Travis got into me with just a little bump, just your average deal. It was nothing major. Then I got down on the speedbumps, got the car loose and the car came out from under me and we got into Travis. Travis Kittleson's car was hurt pretty bad in this accident. “We were racing pretty hard a few laps into it,” said Kittleson. “I was just trying to find a place to fall in. I knew the 112 (Fritts) was going to be pretty strong. I was trying to hold my own. “We went into three and I thought he hit the bumps at the bottom of the track and something broke. He just drilled me and sent me into the fence. Then he came telling me that I hit him. I was like what? 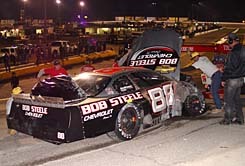 Ted Christopher, who is racing in both the Super Late Models and the NASCAR Tour-Type Modifieds during Speedweeks, finished fifth in his SLM after finishing third in the night’s Mod feature. 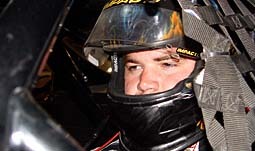 Former CART star Michelle Jourdain Jr. is slowly making his transition to stock cars and he's trying to help that out by racing at New Smyrna Speedway in a Super Late Model. And it looks like Jourdain is a quick learner. On Saturday night, Jourdain led a bunch of laps before eventually losing the lead to Middleton. He then later spun while trying to hold off Mechalides for second. He moved back up through the field to finish 11th. For the second night in a row, Jerry Artuso made little work coming through the field in the Late Model feature to beat Tate Pierce in yet another caution-filled race. Tim Russell finished third. There were several guys that fell victim of accidents on Saturday night. Dalton Zehr, Chaun McWhiter, Bob Danes, Ryan Foster, Ron Vanes, Mike Stacey, Pete Shepherd, Tervor Stewart, Chase Austin, Greg Boone and Alex Yontz all joined Kittleson and Fritts as accident victims on Saturday night.